Thank you for picking-up the 10th anniversary issue of Rochester Women’s Business & Resource Directory. We made a few changes to make this anniversary issue spectacular: releasing the issue in the spring (instead of fall), designing with fresh, bright, happy colors and publishing more native content on RWmagazine.com. 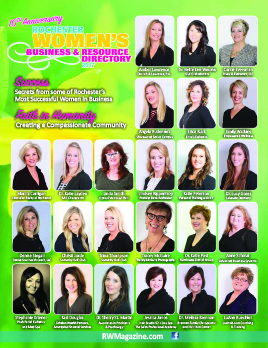 The women on the cover of RochesterWomen’s Business & Resource Directory 2017 are featured throughout the publication. Their contact information is provided in their Advertorial and Business Listing (starting on page 6). They are professionals, providing products and services that will make you feel beautiful, healthy, safe and secure. Contact them to set-up a consultation. Thank you to Katie Kirckof, owner of Glam Beauty Lounge, for providing makeup touch up for Rochester Women’s Business & Resource Directory 2017 cover women. Thanks to Tracey McGuire Photography for photographing the women for the cover and their advertorials. Sarah Oslund, owner of Inspire Marketing & Consulting and Rochester Women magazine careers for women columnist, interviewed professional women about success. Learn success secrets from some of Rochester’s most successful women in business (page 17). Success is unique as each of us; however, our attitudes make us happy. Find out how Rochester became and is becoming an even more compassionate community by reading Faith in Humanity (page 20). I hope you are inspired to become more compassionate. Since writing the article, I have noticed how compassion motivates people and it feels good to understand the needs of others. It’s human nature to be kind, compassionate and loving. I encourage you to consider taking the Allies & Advocates training or asking your employer to adopt a welcome policy for its customers, employees and vendors. Our non-profit Resource Listings (beginning on page 14) are organizations with a mission to serve the needs of our community. Through these organizations, Rochester is a compassionate community. Look at all of the ways we can connect with and serve each other. This entry was posted in Read on July 8, 2011 by Scott Brue.